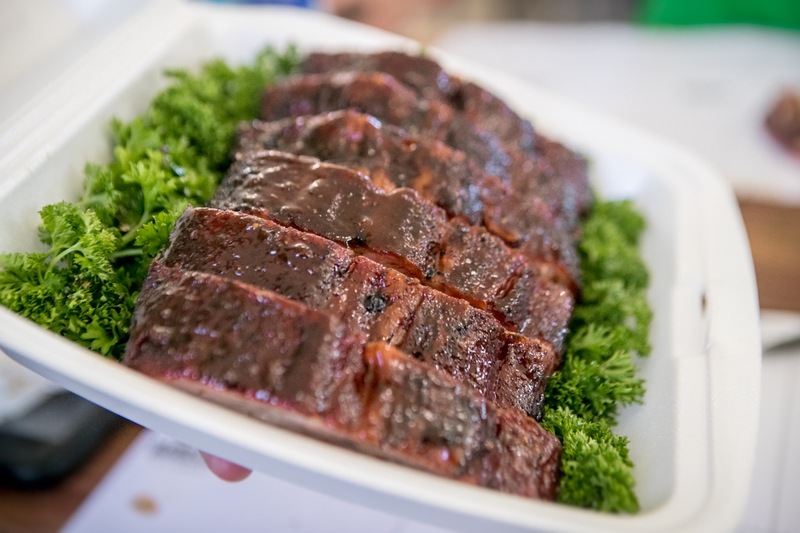 Along with taste and texture, appearance plays a part the final score in competition barbecue. Here are 5 tips to get your competition box looking great. My name is Jess, and I am a BBQ judge. I’ve been certified by multiple barbecue societies and associations across the United States, but perhaps more significantly penned the original judges course for the sanctioning body I helped found, the Australasian Barbecue Alliance (which proudly is now the largest in the southern hemisphere!). I’ve also been invited for the third year in a row to judge the American Royal Invitational. In short, I’ve seen and judged my fair share of hand-in boxes. An example of parsley that has come loose – leave a tail of stem and make sure only the leafy tops are visible. For chicken, ribs and brisket hand-ins, symmetry and identical appearance are key. While most food magazines and cookbooks display rustic, charred and bone-laden meats, the opposite is prized in competition barbecue. All pork ribs should be a carbon copy of one another (rather than including the smaller ribs which taper off). Beware of any dark spots, pulled skin on chicken thighs and uneven burnt ends. Building a box out to achieve the “putting green” of parsley can take much longer than you think, and most folks prefer to do them in advance while the meat is cooking. To keep the garnish fresh and hydrated, soak a paper towel in water and lay it across the freshly-laid bed until you’re ready to fill it. You can find insulated bags made by Pyrex (and other companies who produce casserole dishes which fit the boxes snuggly). Some of them even offer microwavable pouches which sit in the bottom of the bag to provide additional warmth. This can help combat heat loss, particularly helpful during walks at large events where you may be 3-5 minutes from the turn in table. Not only can the parsley layer be time consuming, it can use much more parsley than you may think. An easy way to ‘hack’ the putting green is to cut cross sections of romaine lettuce (called Cos in Australia) and lay them at the bottom of the box, then build the parsley on top of this base. It also allows you to lift the meat higher in the box. Often stray of garnish can be the last piece needing fixing before a box is closed. Then you try to touch it with your gloved finger and just end up having five more pieces stick where you didn’t mean for them to be… Keep a pair of curved tweezers on hand for last minute touch ups. They will allow you more precision without ruining your carefully crafted masterpiece at the last moment.